The os intermetatarseum is a rare accessory bone (ossicle) of the foot occurring in approximately 4% of the population, which ossifies during adolescence or preadolescence and may be responsible for midfoot pain. 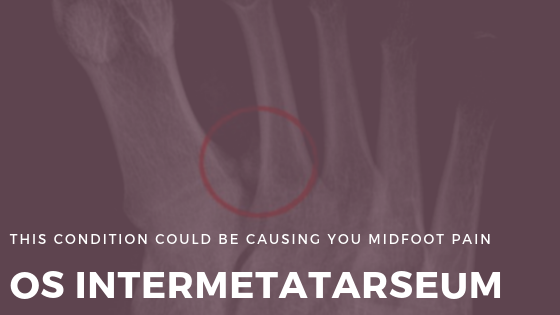 This accessory bone is typically positioned near the base of the first and second metatarsals bone (long bones in the feet) but has been reported to occur near or between the fourth and fifth metatarsal bases (midfoot). Free standing – completely detached accessory bone which does not show any connection with any other structure. Articulating – forms a joint with first or second, metatarsal or the medial cuneiform bone. 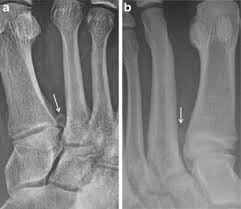 Fused – forms a bony projection within the first or second intermetatarsal space. Tight shoes, ankle instability and cavus or pes planus foot type exacerbate condition. Post trauma, may cause midfoot pain and paraesthesis radiating from the top of the foot to the big toe and second toe. Pain and numbness increases with plantar flexion of the foot and dorsiflexion of the toes, if the deep peroneal nerve is trapped. Can be a cause of midfoot pain and should be considered in your differential diagnosis. Reduction from activity or sports until symptoms reduce. Orthotic therapy to correct foot type and abnormal biomechanics, reducing the impact of the problematic bone with a good foot posture. Removal of the problematic bone. Deep peroneal nerve release relieves the symptoms of pain and paraesthesia, if conservative treatments fail to reduce symptoms. If you are experiencing midfoot pain or numbness in the toes come and see us at Well Heeled Podiatry as we are trained and experienced in dealing with all lower limb concerns and pathologies.